Posted by Eddie & filed under Military/Aircraft, Mountains & hills, November 14 2011. Last week I went for a short walk on the moorlands to the east of Largs, in the Clyde Muirshiel Regional Park. I was looking for the wreckage of a BEA Vickers Viking, one of the first commercial passenger aircraft in the UK, that crashed in the area in 1948 on approach to Renfrew Airport near Glasgow. The wreck site lies at an altitude of about 440m, very close to the 484m summit of Irish Law, about 150m north of the trig point on the summit. All of the five crew and sixteen passengers on the Viking survived the crash. Some large pieces of wreckage remain at the site and most of this wreckage lies in a shallow crater where the Viking ended up after crashing. In this crater lie the remains of the two Bristol Hercules engines, one of which is largely intact and which is still attached to the wing-mounted engine nacelle which also contains one of the undercarriage mechanisms with a tyre and wheel still attached. 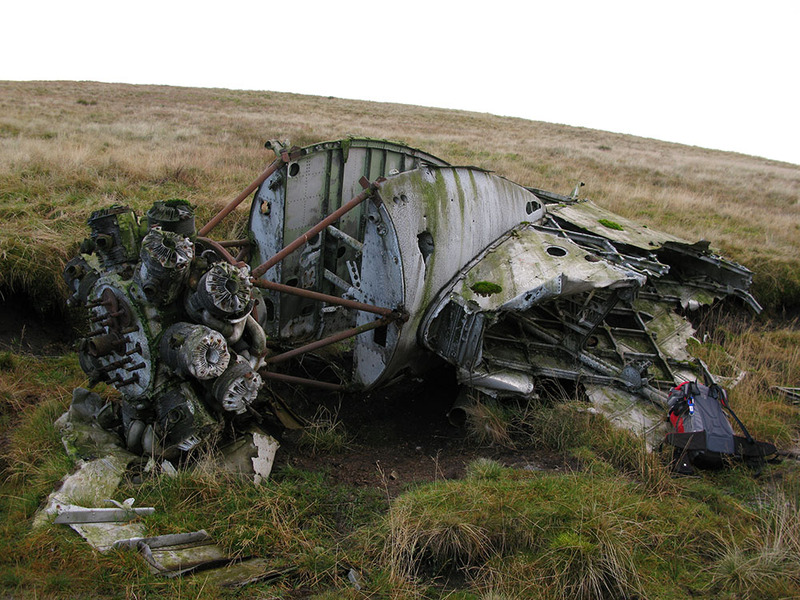 The Vickers Viking was developed from the Vickers Wellington bomber and it is possible to see similarities between this wreckage and that of Wellingtons, particularly in some sections of geodetic framework. There are excellent views from the site westwards to Arran and the Firth of Clyde. 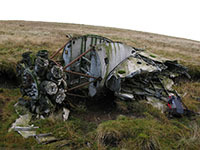 From the summit of Irish Law, it is also possible to see the wreckage from the RAF de Havilland Devon that crashed near the 474m summit of Box Law in 1958, about 2km to the north.